Well, it’s 2013… wow. Where has all the time gone to? In 2012 We went to a couple of seminars, including Denise Fenzi and Chris Zink. We are going to repeat the Denise Fenzi Seminar this March, too, though this year it’ll be in Idaho, instead of Colorado. So a much closer drive for us. In AKC Agility, Jet gathered up 19 Double Q’s in 2012, and 509 speed points. Not too shabby. 🙂 He has all his Double Qs towards his MACH, and he only needs 171 speed points, hopefully we’ll gather the rest of those points by sometime this May. He got his MX and MXJ in 2012, and his first T2B title as well. He also got one leg toward his CD. And hopefully we’ll be able to pick the other 2 legs up in 2013. In UKC Jet got his UWP (United Weight Pull) title, and a Total Dog award, since he placed 3rd place in conformation in the Terrier Group on the same day that he qualified in Weight Pull (though I still don’t like the Danish-Swedish Farmdogs being in the Terrier Group.) He also got 2 legs towards his UKC CD, hopefully we’ll get that last leg in 2013. 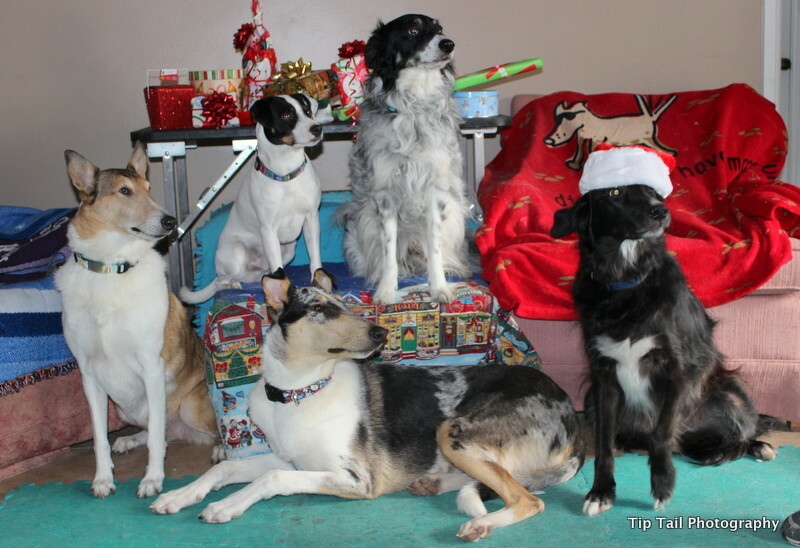 We didn’t do any Flyball in 2012, but maybe we’ll do a bit more in the future, I haven’t decided yet. Jet, Tatum and Quinn and I spent a week at Camp Winnaribbun in August, and had a blast! 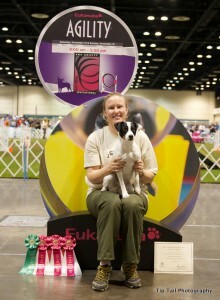 Tatum got one leg in Open Standard in May of 2012 in AKC agility, which thrilled me! She’s a good girl, and has come a long way from where she started. She may never get another leg, but that’s okay, as long as we have fun. She pushes the boys around in the house quite well! Quinn came to join our family in June of 2012. 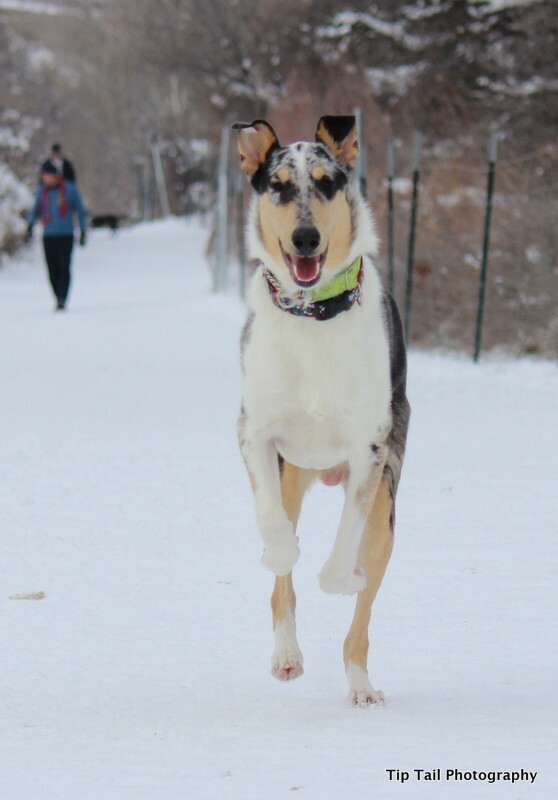 He’s a very sweet, loving, pushy smooth collie boy! I adore him, and it’s good to have a boy smooth blue collie in the house. 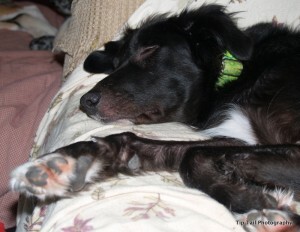 Since we lost Levi in February of 2012… and I still miss him so very much. All in all, 2012 was a very fun year. And I hope 2013 will be just as fun. I hope Jet gets his AKC, ASCA and UKC CD’s in 2013, as well as his MACH. I plan on retiring in August of 2013.. and then, well, the skies the limit! (Well, the money is the limit, actually. LOL). Chase is probably actually retired from dog sports.. though I haven’t totally decided yet. He is becoming my husband’s walking dog, which is good. As is Muffit, our other Border Collie. They are about 9.5 years old now, so may just have some leisurely retirement years themselves. Got this picture at Christmas, we have a very nice pack! It’s been a month since Levi died, I still miss him terribly, and it’s interesting to watch how our pack dynamics have changed. We only have four dogs now, down from our high of seven. Four dogs is like having hardly any dogs at all. The biggest change I think has been Chase. He’s the oldest now (8.5 years), and he has space issues with dogs he doesn’t know. He will attack without warning when we go out and he’s too close to other dogs. He will still do this. He always hated having foster dogs in our house. So he’s the happiest one of them all that we no longer foster. He’s very relaxed at home now and, strangely enough, he’s becoming our mediator dog. Chase and Levi never got along. Levi would grump at Chase on a regular basis. But now Chase loves to play with Jet (he did before, but he’s more relaxed about it now). 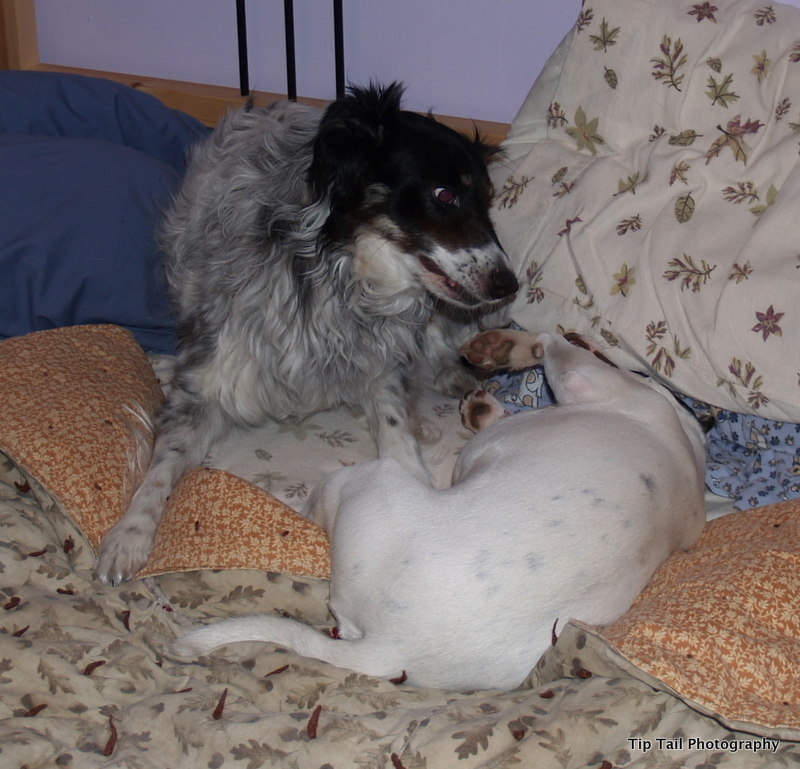 Chase plays with Tatum too, and kinda tolerates Muffit. Muffit barks at Chase when he (Muffit) wants to play, which annoys Chase to no end. But after years, Chase is showing lip and teeth when he gets annoyed. We think that Chase’s warning system was punished out of him before we got him. So he’d just explode without warning. At home he gives warning now (he was giving warning before Levi died too). Chase hasn’t started a fight at home in probably over a year. It’s quite nice. Jet has been having issues with being unable to stop when he starts fighting. I believe he learned it from Levi. Jet didn’t learn a good way to tell another dog that he’s been hurt or he wants something or needs another dog to stop something. I blame Levi, and myself, of course. Hopefully we’ll work this out. But anyway, a couple weeks ago Jet was going off on Chase, and Chase just stood there in the back yard with Jet latched onto his cheek. This is HUGE for Chase. Before, Chase would have fought back and not have stopped. 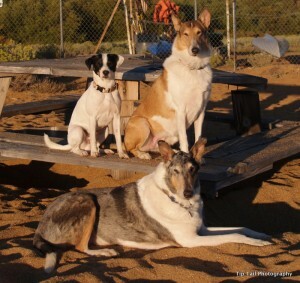 But now, Chase is like our medium dog that has taken on the role of smoothing everything over. It’s really cool. Anyone in a multi-dog household understands that dogs fight. It’s what they do. Our dogs have good bite inhibition and don’t break skin. But they sure sound mean. And they don’t fight without reason. People yell at each other, dogs growl and snarl and fight. And our house is kinda small, so the dogs are close together a lot. Maybe we need some wood pergolas to lighten things up, but we can’t afford anything now! My husband and I aren’t sure who is highest ranking dog anymore. It’s probably Tatum, our only girl. But it could be Muffit, he doesn’t put up with anyone’s crap. It’s not Chase, he’s just the middle ground dog. And I don’t think it’s Jet either, even though he’s intact. Though we think Jet wants to be. It’s one of those flowing easy going packs that just get along. It’s quiet and nice. It’ll be interesting to see how a puppy throws them all for a loop again. Chase will probably have the hardest adjustment, he always does, but hopefully he’ll adjust quickly. Lately I have been having a really hard time dealing with the loss of Lucy. She was the hardest for me, even more so than Angel last year. Or Littles just last week. I realize that I have a really hard time dealing with death. Not that anyone has an easy time of it… for one thing, though, my dogs are my kids. They mean as much to me as any human I know. My core belief system is that I am an animal. I am a human animal, and my dogs are canine animals. I am no better than them. Maybe human belief systems follow that humans are ‘better,’ somehow, than other animals. I do not believe this. I am more of the belief that I am the same as the earth. I live on the earth and I am as a tree or a rock or a bush. Or a deer or a rabbit or a dog. Maybe this is more like the American Indian belief system. Or the pagan belief system. Which I prefer to follow for myself. So when a dog does, a part of me dies. Even though at the same time a part of the dog lives on inside of me. Still, I feel empty and hollow and I don’t know how to deal with it. Since I don’t really have an after-life belief system, either, I’m not sure where they go, though I do have my ideas. Anyway, where I’m going with this is that all my life I’ve really avoided getting close to people. I’ve had trust issues with people. Haven’t really trusted those who were trustworthy in the past, instead I’ve trusted those who were not trustworthy. Though I think that I’ve changed in that regard now, it’s still hard for me to get close to fellow humans. It’s always been easier for me to get close to dogs. 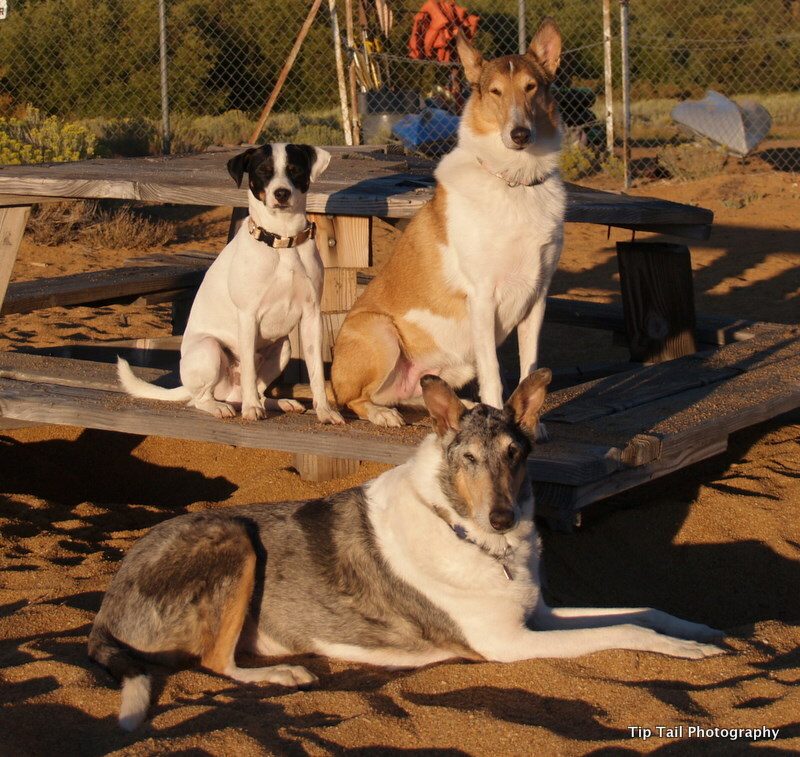 And so the main support network I have in my life is that of my very short-lived dogs. And so when they leave me, I’m pretty crushed. Though now I’m at a place in my life where I can finally trust people more, get close to people more, which is a good thing. And most of my life I’ve really denied the thought that I need people, and dogs, to rely on as close friends and family. And I’m so worried about Levi. He’ll be 12 in just about a month. And sometimes I think that my entire world of sanity is balanced on his life. Which is way too much to ask any creature to endure, I know. 🙂 Even though he gets extra attention now, which he really loves. So I guess where I’m getting to with this is that today I had some sore of revelation. That it’s natural to love these creatures in our lives. And it’s so sad when they have to leave us. It’s just a natural part of life and it’s okay to love completely. I’ve avoided loving completely, because it means that when the object of your love is gone, then live is just about over and being crushed and miserable sets in. But it’s okay to have both, isn’t it? To love completely and still go on living. It’s natural and normal. Guess it took me a long time to realize this. But I have always loved my dogs completely, without reservation, unconditionally, just as they love me. They are so much easier than humans. So very much easier to love and live with. I’ve been sick the last few days and feeling pretty rotten. I know it’s a combination of having too many losses, stress, catching some nasty cold, and also this underlying virus that I think I carry with me all the time. It all adds up, dangit. But today, or at least right now, I can look at our little graveyard of ashes in our cabinet that I have set up, and find a little bit more peace. At least for a while. So I have to get back to the normal aspects of life. Missing those I’ve lost. Settling into a new life with the ones who are still alive. Maybe I’m a nut, I dunno. Maybe I just need a Steripen Adventurer Opti water filter to keep myself healthy… oh, and I joined Weight Watchers, to drop these awful pounds I’ve put on in the last couple of years. Still gotta take care of myself, eat healthy, and love completely the family I have with me still. And try to come to realize it’s okay to love completely, as well as lose completely. And still be okay. It’s strange, still, to only have five dogs now. It’s actually been strange to have had only six. Since Angel passed on in May 2010, I still kept trying to count for seven dogs. I hadn’t gotten used to six. And now I’m going to have to count for five dogs only. Yeah, my husband and I would count dogs to make sure we had them all around. Home safe. Not getting out or running amok. I think I am coming to terms with losing Lucy. I’m still very sad, and last night cried again in bed before I went to sleep. I miss her so much. I wish that I could have put her in a bed, given her meds, and kept her around like I would have kept a person around. But dogs don’t work that way… and seriously, it’d be nice if we could put people out of their misery, too. Lucy was miserable. It was her time to go. I just still miss her so much. Today we took a trip to the desert to let the dogs run. It was a short trip. Long drive, about 45 minutes, and it was too hot to let the dogs run for too long. But they did have fun. Levi isn’t very strong anymore and can’t go very far. I sure hope he’s okay when we go to camp. I will take it slow for him, give him what he needs, and sit around on the beach of Lake Tahoe all day if we need too. Which, really, won’t make me sad at all, sitting on the beach all day! I am trying out a new gallery, too, so above are the thumbnails. Though I’m not quite so sure how it works, yet, and I may just add the images individually too. We adopted Muffit back in January of 2008. We’d fostered him a year and a half before that. He supposedly went to a good family. However, they were not good. They dumped him at the Utah Humane Society without calling the rescue back. Poor Muffit had to suffer at HSU for 2 weeks before they scanned him for a chip. When we got him back (he was still registered with the rescue, who called us first) he was sicker than any dog I’d ever seen before, and I thought we were going to lose him. Three rounds of antibiotics later he got better and returned to his normal self that we remembered. Though he was less confident and more frantic than when we’d fostered him before. Poor guy, can’t blame him. Who knows what he went through. My husband and I didn’t even have to talk about it, we knew we were just going to keep him. I thought of training him for flyball but he gets so frantic he has a hard time concentrating. So he ended up being my husband’s dog. And now my husband is his favorite person in the world. Aaron takes him hiking a lot in the summer. He takes him a fair amount in the winter too. On the days I’m home and Aaron isn’t, Muffit just seems kinda sad. He misses his favorite person. I don’t mind not being that person, I have enough other dogs to take care of. I wouldn’t be able to have six dogs without my husband. I wouldn’t be able to give them all enough attention. My husband is amazing, and I’m glad he’s developed a great relationship with Muffit. (Muffit is named after the mechanical dog on the original Battlestar Galactica show).